Schlafen, Essen und nicht frieren! Rosentorp – Das ideale Basecamp! Spjärshällen – Berg, Windschutz und jede Menge Aussicht! Tiveden Nationalpark – ohrenbetäubende Stille! Rumänien 2018 – Fast wie eine Zeitreise! GPS or paper maps? GPS and paper maps! On this page I would like to give you some tips about navigation and cartography for Sweden and Norway. Whenever I am doing route planning I am using a variety of maps. So far nothing beats a paper map if you want to combine large area coverage and degree of detail. You unfold the map on the floor or table and you see hundreds of square kilometers in full detail. If you look at a map on your GPS or computer screen you will get only one of those two: high degree of detail or large area coverage. That’s why the good old paper map is still a must have for route planning. I once made arrangement to meet a fellow German motorcyclist at a very nice spot on the east side of lake Malingsbo, one of my favorite tent sites. I wrote him a few times we meet „east of the lake“, but that evening he never showed up. When I finally got him on the phone next morning, he was on an official (=boring) campground on the west side of the lake. When I saw the map he carried I could understand that he never found the spot I told him – his only map covered all of Sweden, so it did not even come close to the amount of detail necessary to find the small gravel roads. Let me give you some examples of those maps I am using! 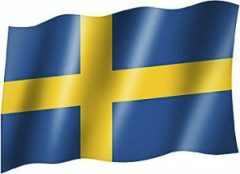 For Sweden I am mainly using Motormännes Sverige vägatlas, which covers all of Sweden in scales 1:250.000 (south) and 1:400.000 (north). This one shows basically all roads down to logging roads that are legally accessible for motorized traffic. Also some long distance hiking trails (like e.g. Sörmlandsleden) are shown, so are campgrounds, hostels and points of touristic interest. That same kind of map is available as six single sheets from Nordstedts publishing, which makes more sense to carry in you luggage if you don’t need to cover the complete country. Here an example of that map, approximately in the same scale as on the Garmin 276cx, running CityNavigator. Observe my favorite place Rosentorp, marked with a pen on the map and a red dot on the screen! For Norway I am using Capellens maps (Bil- och turistkart 1:335.000) which is not published any longer, but now available as a reprint from Swiss publisher Kümmerly & Frey. This map has a nice graphic design showing major and minor roads down to most forest roads, however there might be some very small ones which are not in the map. Because of the background shading you also get a good idea of terrain features. It shows also campgrounds (with or without rental cabins), viewpoints, mountain top elevations, and (very important in Norway!) pay stations for private roads and road barriers. Even mountain huts and hiking trails with walking times are there, but if you really go backpacking you NEED to get a good topo map! On my GPS units (currently Garmin Montana 600 and a 276cx) I am mostly using Garmin CityNavigator maps. Those show a good amount of detail. On the great screen of the 276cx on the 1.2km setting or below you still see the smallest gravel / logging roads as grey lines on yellow background. Sometimes I am switching to the Friluftskartan Pro (topo) which also contains contour lines and natural features, but this one is hard to read while driving. There are two interesting digital maps available on the web for Sweden. I hardly ever use Google Maps, because small roads in the woods are hardly visible. Instead there is Länskartan, a digital map service supplied by the government of Sweden. If you zoom in you basically get an extremely detailed topographical map, showing all roads, tracks and trails down to footpaths. Of course it has also contour lines, elevations, natural features, official marked hiking trails and much more. In the settings you can chose to show map layers like nature receivers, place of historic interest and more. http://extra.lansstyrelsen.se/gis/Sv/Pages/default.aspx then click on „Sveriges Länskarta“ As a comparison to the paper map again the same area, with Rosentorp almost in the middle. Another useful digital map resource, if you want to know if a certain road is paved or not is the National Road Database map. On the right hand side you will see a pulldown menu, there you chose „slitlager“ and if you zoom in sufficiently you will see gravel roads in green and paved roads in red. For Norway there is a nice detailed map available from the site www.visitnorway.com. Go to the main menu where you can chose „map / kart“. Like it’s Swedish sister this map is zoomable down to a very details topographical level, which gives you contour lines, elevation information, natural features and much much more! If you have more tips for good maps, both paper and electronically that are a good planning help let me know and I will update this page! Saisonstart 2019 – ab jetzt auf KTM 790 Adv R! Rumänien – Besuch bei Dracula! Rumänien – nicht Norden sondern Süden dieses Jahr! Manuel bei Saisonstart 2019 – ab jetzt auf KTM 790 Adv R! Svendura bei Saisonstart 2019 – ab jetzt auf KTM 790 Adv R! KU bei Happy new 2019! Peter bei Happy new 2019! Peter bei Der Frühling ist da!